Most of the time, my favorite books to read are ones that focus on the characters. In my opinion, there is nothing better than reading about a well-formed character with deep roots that grow throughout the length of the novel. 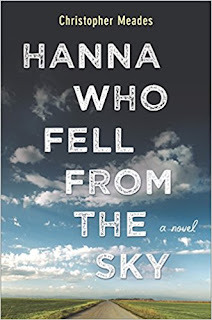 With Hanna Who Fell From the Sky by Christopher Meades, I got exactly one of those books. Hanna is a girl who is the daughter of a former leader of a fundamental branch of a polygamist religion sect in Utah. She’s never been outside of the inclusive town of Clearhaven. Her mother is one of four wives. Long ago, her father was one of the leaders of the cult, but his age has left him behind and bordering on destitute. Hanna, who will be eighteen very soon, could be the key to him regaining some of his former glory. An arranged marriage with another leading member as a fifth wife could be exactly what the family needs. Hanna has questions about her future, but it is not until she meets another teenager from the town that she really starts questioning what’s ahead for her as a sister wife. It’s only the fate of her crippled younger sister that makes Hanna hesitate on forging a new path for herself. In the end, the pull of the limitless opportunities is too strong to ignore. When her mother finally tells her the secret of her birth, she has that impetus to strike out from what she’s been subjected to her entire life. This book is written from the point of view of a seventeen year old girl, isolated and on the cusp of becoming a married woman. Her thought process in the earliest part of the book very neatly follows the tight, ingrained thinking that is a part of a closed society like that of a cult. She can’t quite grasp the freedoms waiting for her just outside the long arm of Clearhaven. As the story moves forward, her thinking, while still strongly influenced by her upbringing, slowly opens more and more. Daniel, the boy she finds herself attracted to, is also one of the members of the cult. His parents are leaders in the community, and his older brothers have been expelled from the group as a means to make sure there are enough women for the elders to marry. He overtly revolts against all that, and leads Hanna towards freedom. The two teenagers have the same emotions as typical teenagers outside the cult. They want to explore the world around them, and the feelings they get are very real. There is a bit of awkwardness, especially on the part of Hanna. Still, this is something that all of us have gone through at some point in our adolescence. Meades captures this perfectly. Daniel seems a bit more worldly than I would have guessed from living in that society, although he did live elsewhere before Clearhaven. His philosophical views are quite a bit above what one would expect from a boy his age, regardless whether he was in a cult or not. That was probably the biggest stretch in the book regarding character development, in my opinion. Hanna Who Fell From the Sky by Christopher Meades was an entertaining book that, while not riveting like the thrillers I usually read. It was engaging as you pulled for Hanna as she fought to become ensnared in the trap of Clearhaven. In essence, this is a true coming-of-age and love story. It makes you question everything you take for granted. It was a satisfying book to read. Craig Bacon thinks his wife must have fallen from the sky. She is either an angel, a saint, or both. She puts up with his nonsense daily.